PRISTINA – Minister of Foreign Affairs of Montenegro Srđan Darmanović said that Podgorica supports Belgrade-Pristina dialogue, adding that the agreement would eraise the problem, appeared after the breakup of ex- Yugoslavia. As he said at the press conference in Pristina after meeting Minister of the Republic of Kosovo Behgjet Pacolli, there are three problems left beyonde the ex-Yugoslavia. “We are supporting Belgrade-Pristina dialogue. There are three problems left beyonde the ex-Yugoslavia. The question of Macedonian name is, which is resolved, the second one is the relationship between Kosovo and Serbia and the third one is Bosnia and Herzegovina and its functionality”, Darmanović explained. 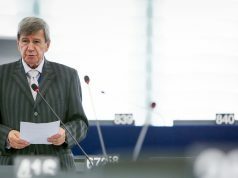 “As for the second issue, we want all the best for Serbia and Kosovo, to resolve this problem in the best way and to have reciprocal recognition in the end of the road”, pointed out Darmanović. Minister is in Pristina where he attended the celebration of one year Agreement ratification on Border Demarcation in the Kosovo’s Assembly. “We do not invole in your internal affairs. We are here if we can help you. We have some concerns related to the borders corection. It is not the best idea, but if it is for our neighbours, we do not have problem with it”, Darmanović underlined, adding that the demarcation for Podgorica is resolved problem. 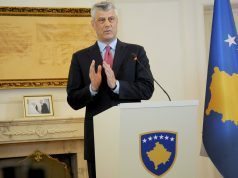 Darmanović also met with the Prime Minister of Republic of Kosovo Ramush Haradinaj.